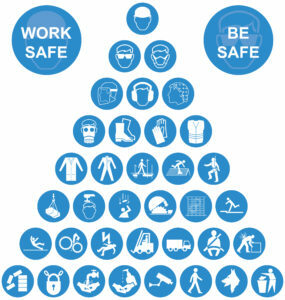 PPE or personal protective equipment comes in many designs and uses. During a risk assessment, the need for personal protective equipment or PPE is identified and which type is best suited to be used. PPE is equipment that is used by the employee to directly protect them from harm or discomfort while at work. PPE can also improve the way things are done by making it more comfortable to work. There are many different types of PPE to protect different parts of the body and what you will need will be advised by your employer. When your employer provides you with PPE you must wear it and keep it well maintained. If the PPE is damaged it is no longer effective and can become a risk itself and cause you harm. Report any damages and do not use damaged or PPE that does not fit you.